The South Sea Company was founded in 1711 by Robert Harley. He established the South Sea Company while he was the Lord Treasurer of England. In this role he was responsible for the British treasury. Upon creation, the company received a monopoly position for trading with Spanish South America, from the British government. This had a dubious value as the British were still at war with the Spanish (War of the Spanish Succession 1701-1714). In 1713 the company actually received some trading rights with the Spanish South American colonies. These were very limited compared to initial claims. The first actual voyage to South America did not occur until 1717. However the trading rights were not the main purpose for the company. The war with Spain was a large drain on the British financing. There was a need for cheap funding. The South Sea Company convinced government bond holders to trade their bonds for stocks in the company. By doing this the company received a stable source of revenue (the interest payments from the British government). The stock owners (the former bond owners) gained the potential of large profit from trades with South America. The government gained a relatively cheap source of funds. Basically the company was a front for the government to trade its debt (bonds) for equity (shares in the South Sea Company). To ensure this trade was profitable for the government and the company, the stock value was talked upwards. Company officials spread wild rumors of incredible potential profits from trades. This sparked excessive speculation from investors. Furthermore the company was giving large benefits to British nobility and government officials. Their visible involvement in the company deepened the investors trust in the company. During the peek year (1720) the stock price rose from a hundred pounds to a thousand pounds. A frenzy of investing developed, engulfing every layer of society. From lackey to lord, people were investing into stocks. This sudden surge in available funds, spurred a wave of stock issues from dubious businesses. From companies claiming to regain sunlight from plants to companies claiming a profitable adventure (but not mentioning the actual adventure). 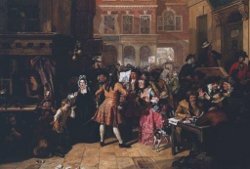 This rally continued until august 1720 when the companies stock reached a thousand pounds. By the end of the same year it was back at a hundred pounds. In the aftermath many banks got into trouble because of loans extended with the stock as collateral.